Escalante, Utah...a new found desert appreciation. Escalante…just repeat that to yourself slowly…once, twice, ok were ready! 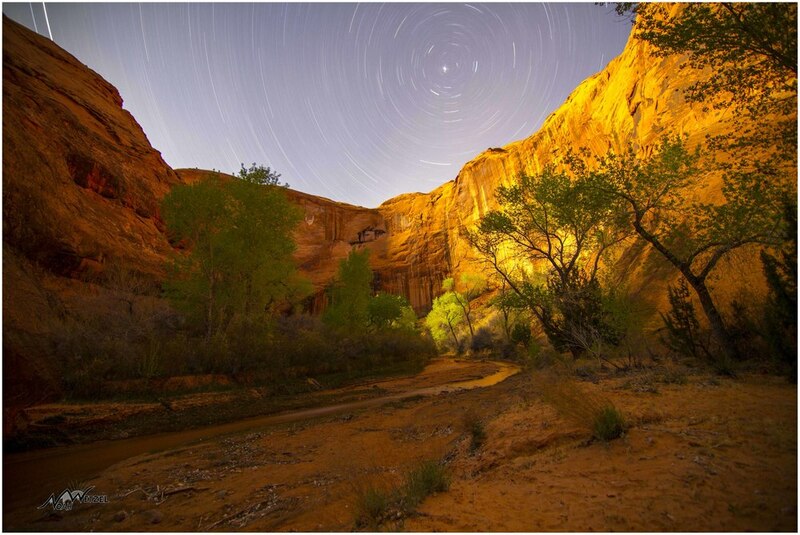 Escalante is a small town in southern Utah and home to the 1.9 million acre Grand Staircase National Monument, along with the Escalante Petrified Forest State Park. 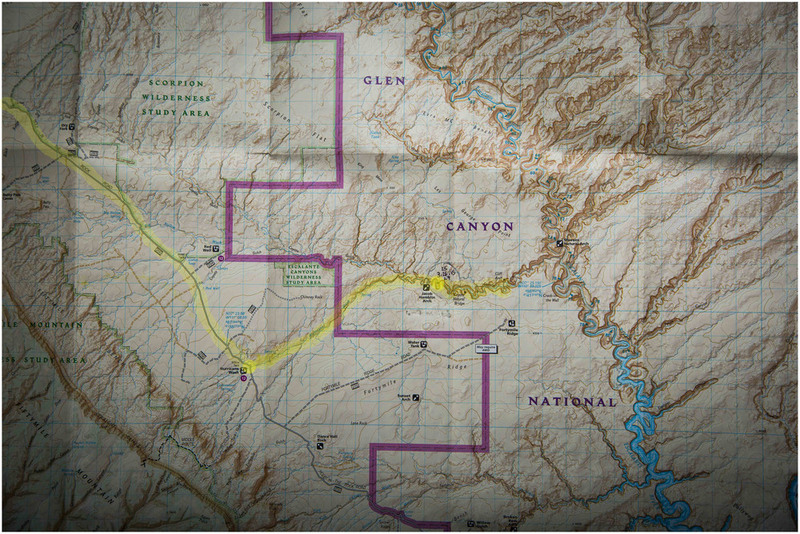 If you are familiar with southern Utah, a single pass through Escalante wouldn’t reveal anything unexpected. The town itself is roughly 800 people and its Main St. is only as long as a good tee shot in the game of golf. There are a few quaint restaurants, mercantile and convenience stores that are rich in history and flavor, however the true story lies within the surrounding area. This past winter was a mild one for most of the west, Alta included. With that opportunity, I made a few trips down to the desert starting in late March. The first trip involved backpacking Coyote Gulch starting from the Hurricane Wash Trailhead located down Hole in the Rock Road. Hole in the Rock Rd. is roughly 50 miles and traverses south to Lake Powell. The desolate and sandy road cuts through sagebrush and accesses many different trailheads that offer slot canyons, creeks, waterfalls and much more. 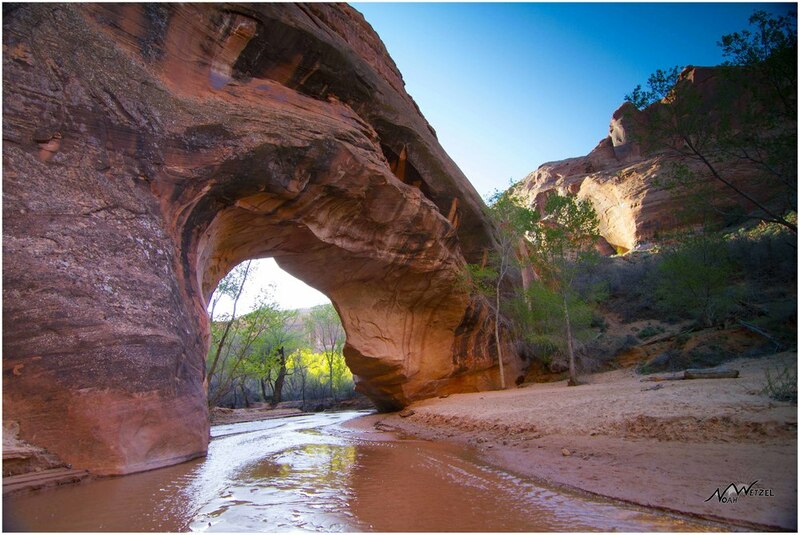 The first day we hiked in 7 miles on Hurricane Wash, leading to Coyote Gulch where we camped just past the beautiful Jacob Hamblin Arch. 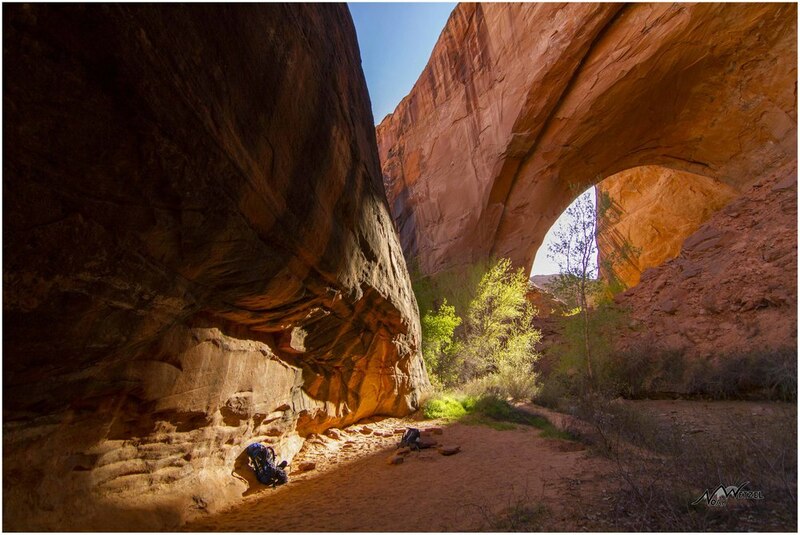 Coyote Gulch is well known, and for obvious reasons. The ideal time to make this journey is in the spring and fall. However with that said, during the day we didn’t see more than a few people. 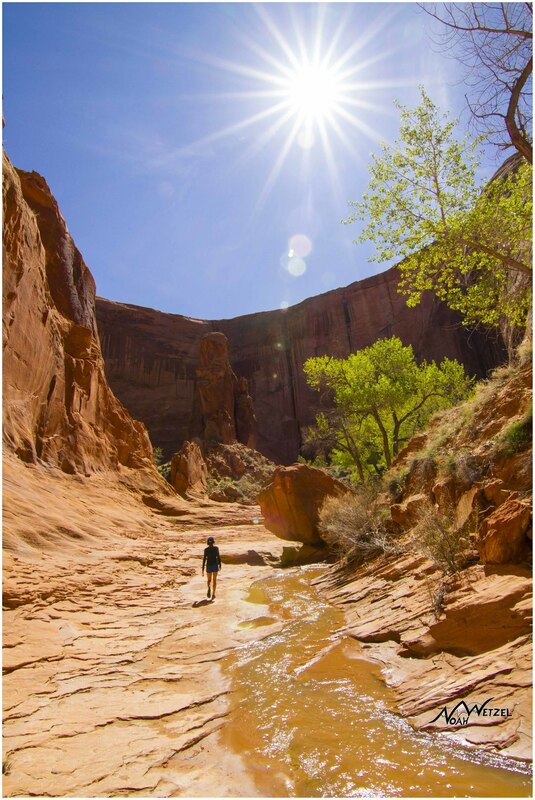 Once you get to Coyote Creek, all you need is a pair of Chaco’s or Tiva’s to truly enjoy the ankle deep water while navigating your way through the tight bends of the canyon. 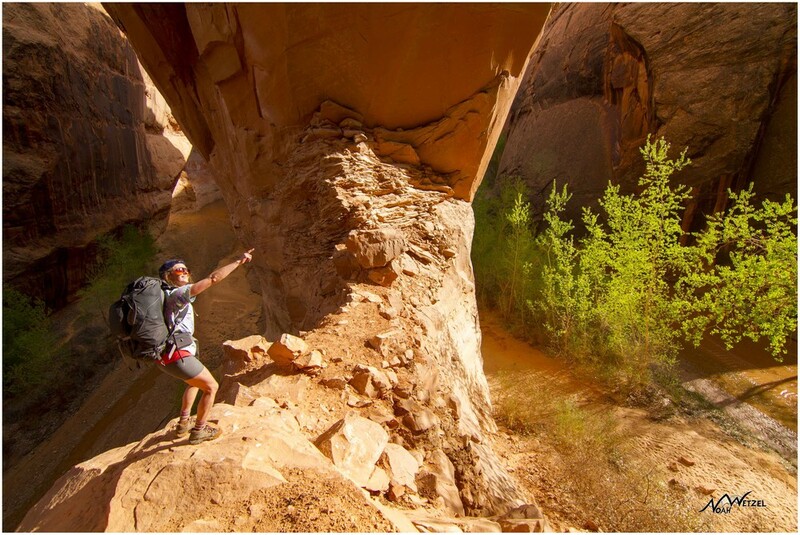 The second day we spent exploring Coyote Gulch with the goal of making it as far as we could in the direction of the Escalante River (a tributary to Lake Powell). 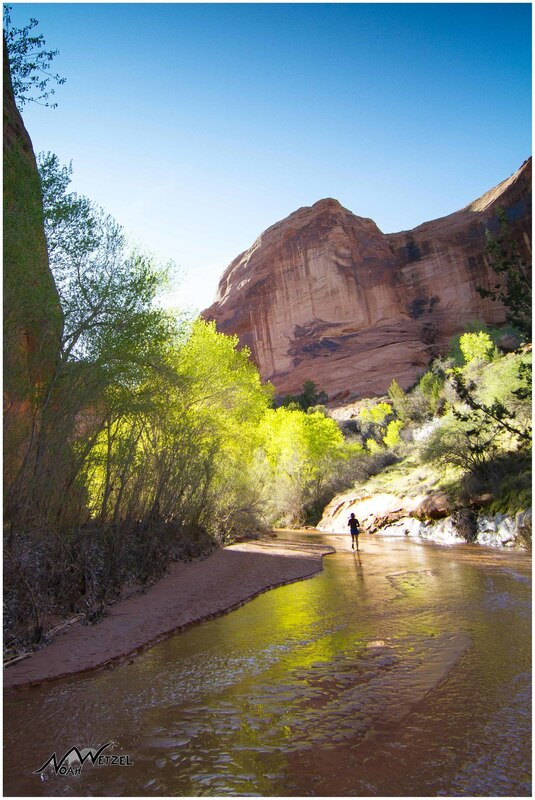 With no rush or priority, our only focus was to enjoy the sunshine and red rock…simple! 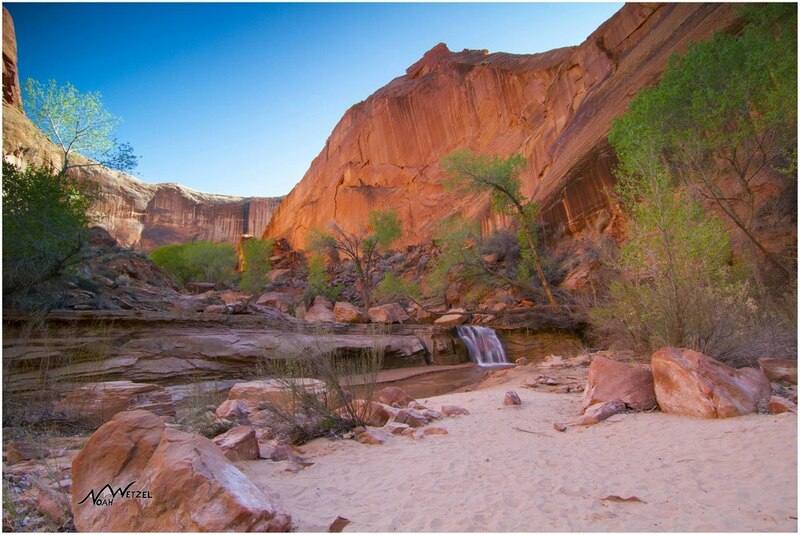 Along the way Coyote Gulch winds itself through beautiful red towering walls with multiple sandy beaches, small cascading waterfalls, arches, and small sections of grassy knolls that offer a perfect campsite. It was late March and the cottonwood trees were just starting to bloom. 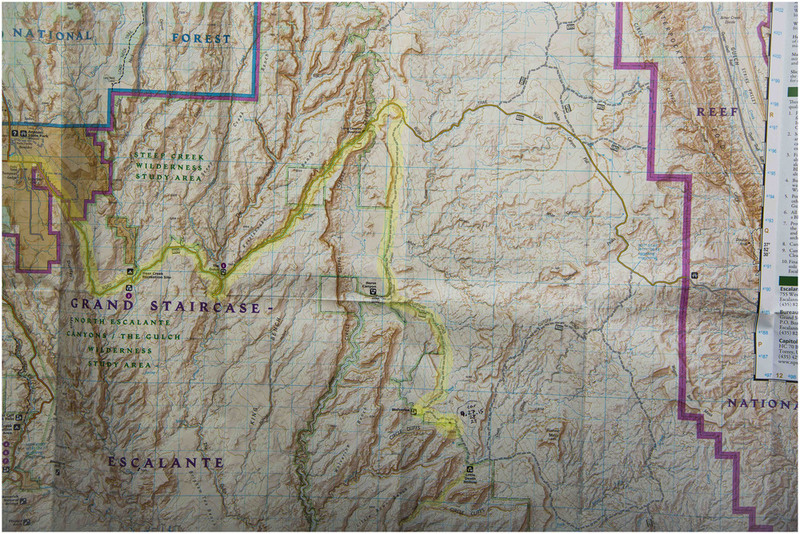 We made it just a few-bends from the Escalante River, however it was far enough. A beautiful waterfall grove would capture our attention stopping us dead in our tracks, providing a great spot to kick back for a few hours. After exploring most of the day we slowly began to work our way back to camp. 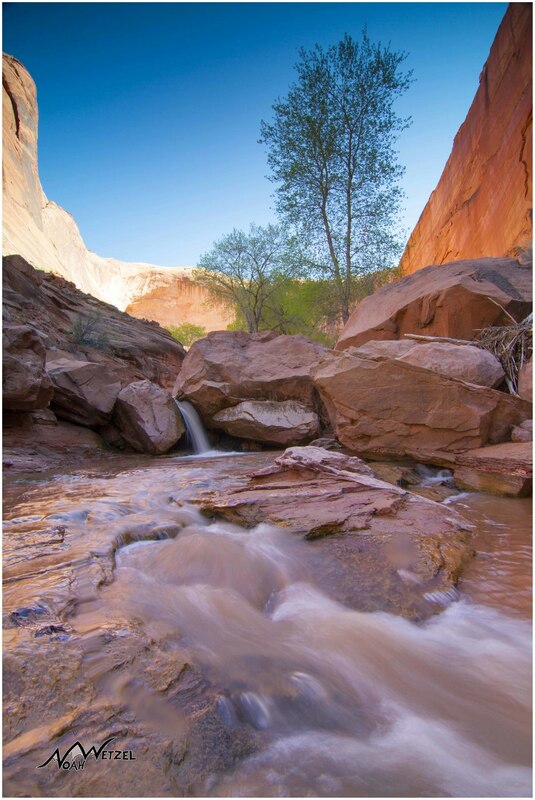 It was one of the most relaxing hikes one could imagine, and it would prove to be a photographers dream. It was now late in the day, a perfect 70 degrees and we were headed back up the canyon in a Northwestern direction. The canyon walls were lit up, and the sky was a vibrant blue. The trees were beautifully backlit creating an unbelievable neon contrast that begged for just “one more picture…this is the last one, then we’ll keep moving.” This afternoon stroll was an all-timer in my book, with a variety of breathtaking beauty around each corner. I mean…I’m going to stop talking because it’s too difficult to attempt to describe! Dusk arrived as we reached our camp and we quickly realized the uncanny ability of Ravens to open zippers of packs and tents and demolish food…commonly referred to as “raven raid.” Thankfully we left a few things in the tent that survived…on a side not, I’m moving away from dehydrated meals. Although delicious, they are nothing more than empty calories, leaving you with a gut ache in the morning. All right…back to the trip! We ended up hiking back to the TH the next day completely amazed at how lush the landscape could be within the canyon walls when compared to the dry arid landscape. At the end of every trip there is a moment of true indulgence where you realize how good the food tastes… that you were eager to dismiss from the trip due to weight and or expiration dates. These thoughts often creep into your mind 2-3 miles from the TH at the end of a journey. Thoughts of burgers, ice cream, fried chicken, chips, anything really. The thoughts don’t end, and calories or fat are no concern! When you finally reach your vehicle, hopefully you’re lucky enough to have something to indulge in! For us, we found a cold “Hops Rising” beer, and a perfectly ripe avocado with a bag of Red Hot Blues. Sitting on the tailgate, barefooted and bathed in the pleasant afternoon sun…there’s no way anything could taste better or be more refreshing! Funny how that never changes…right?! Now, if only the journey home was as rewarding as that moment…or even the drive out accompanied by warm angulated rays on the sandy washboard of the desolate Hole in the Rock Rd. 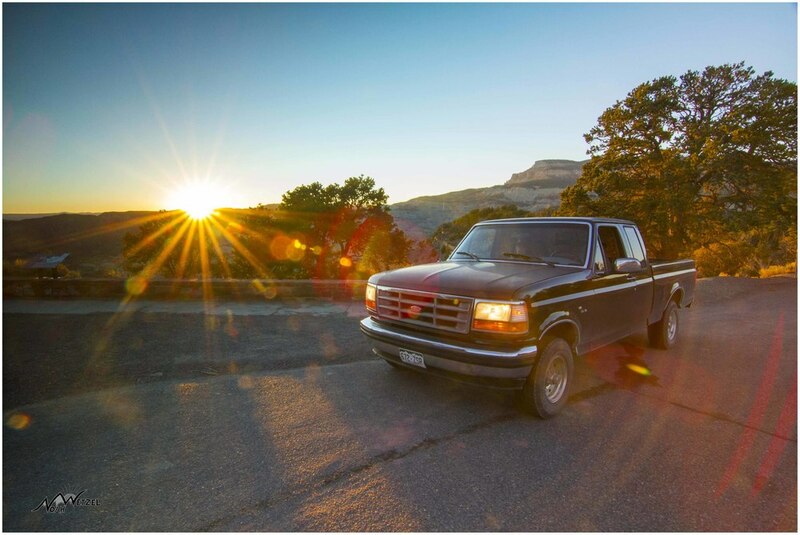 Unfortunately “the Beast” (my 1994 Ford F150) didn’t quite make it back after breaking down 200 miles south of Alta on I-15. Yup…that was fun! But, I imagine that’s the small aspect of adventuring that you eventually experience, and if it hasn’t occurred on one of your adventures…it will at some point, and if you’re lucky you will break down, well…anywhere but Nebraska! One month later after the closing of Alta Ski Resort, I found myself back in the desert exploring Canyonlands, the San Rafael Swell, and Goblin Valley before departing once again to Escalante. This time a different vehicle was the only requirement…haha sorry Beast! On the drive down we stopped at Bryce Canyon National Park and spent the night @ the famous Ruby's Inn before leaving for Escalante the next morning (located only 1 hour away from Escalante, UT, Bryce Canyon is a perfect pit stop). Anyway, in my mind anytime you turn onto a road where the bushes jut out into the road and grass creeps up between the cracks…well that’s always a great sign! Turns-out my gut was right. We would journey down the stunning Burr Trail Road before turning right onto the somewhat rough Wolverine Rd (occasionally washed out and unsurpassable depending upon the time of year) and travelled down it for about 12 miles if I remember correctly. 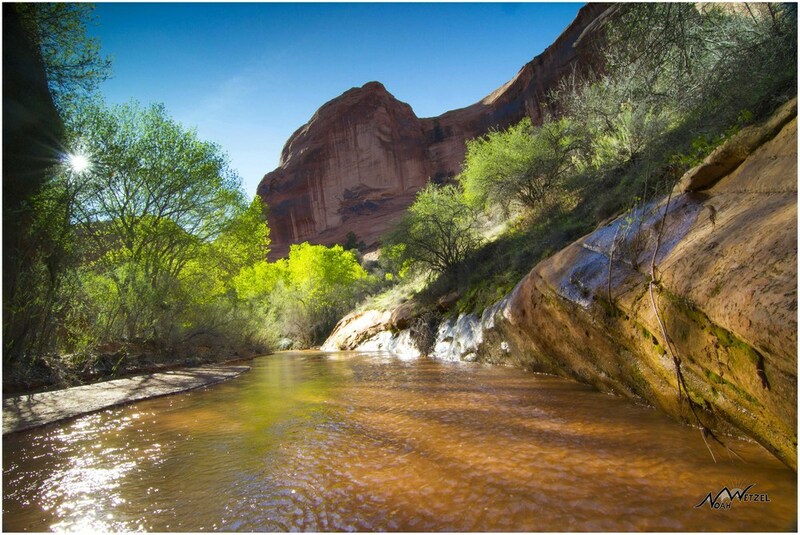 We decided to set up camp between Wolverine TH and Little Death Hollow TH (both of which meander southwest into Coyote Gulch from the East). What is the most noticeable aspect of this area you ask...barely a soul. This is what makes car camping acceptable to me (besides great meals), and throughout the course of the next two days we saw only a few vehicles traveling the road, and had only one interaction with a few hikers. The solitude eliminated any remaining concerns, and the surrounding hillsides and nearby trails provided enough to explore during the day. Turn off the mind. Enjoy the present moment. We finished our trip with a quick bite to eat at the Burr Trail Grill (equally as satisfying as the avocado, chips and beer). The Burr Trail Grill delivered…great sandwiches, desert, and cold beer. This is a true gem of an ideal locals eatery with all the character one would expect from the desert! Last year my brother Ben and I decided we were over car camping…”what’s the point, its too easy?” Whether you’re backpacking or car camping, there comes a time and place for each and I now have a newfound respect for car camping! Exploring Coyote Gulch and Burr Trail Road has only left me with a bittersweet taste. Sure it’s awesome; the beauty within the solitude, the lush canyons and the contrasting color of the varying layers of rock. The only bitter aspect is knowing I won’t be able to explore it all in my lifetime, therefore the only option is to get down to Escalante as soon as possible to continue exploring. Wellpp… guess I better get moving!